The tree won this battle, don't you think? It’s kind of hard to find something good to think about when the world comes crashing down without even a hint that something is wrong. 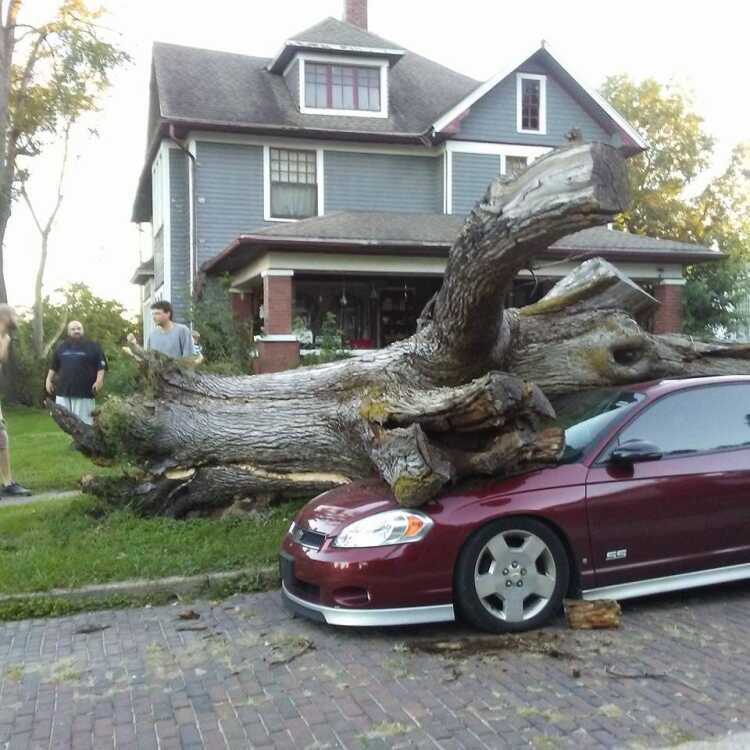 Around 7:20 p.m., Monday, Sept. 17th, a city tree literally crashed down on my brother-in-law Josh’s car. My husband and I heard the loud thud but didn’t think much of it until our neighbors came to tell us what happened. They were outside when it happened. While that all sounds kind of bad, it really is bad because Josh fell in love with this special car. It was his first real big purchase and he was very proud of it. After a few weeks, he was talking about joining a car club and entering it in car shows. That was a big topic while our family strolled through the car show at the Route 40 Fest the prior weekend. He was also planning on taking a vacation trip in the car back to Texas in only a few weeks. I had to wake him up to tell him the bad news while my husband swept up the glass from the tinted windows that exploded all over the street when the huge tree flattened it. I don’t think he realized what was really happening when I woke him up. He looked dazed and very confused. As he stepped out the front door of our house and had to face the destruction of his car there was a rather verbose string of lewd and angry expletives that tumbled out before I think he even thought about what he was saying. Although it might offend a few people to say this, it was actually pretty impressive as far as I was concerned. I had to hide the fact that I started to laugh because my grandmother said a long time ago that it’s not nice to make fun of someone’s misery. However, I think that is the most I’ve ever heard Josh swear in all the years I have known him. That, and the fact that he said it with such a calmness that probably wasn’t actually what he was feeling at that moment, set the tone for the night. We were very pleased with the members of the city police and the street department who showed up, and all the other people who drove by and waved or honked their car horns at us. A few people even stopped to take pictures of the behemoth of a tree squashing a car on a clear, beautiful, wind-free night. This is the reason that living in a small town is so special, and so is Brazil in many aspects, especially when it comes to those who are our neighbors. At the end of the evening, Josh wasn’t happy about what happened, but it also made him happy to know that so many people cared. Fast forward to the next morning when the city workers arrived bright and early. They went straight to work with all types of equipment and the tree was removed, cut into pieces and they were gone in less than an hour. The front yard looks very odd without it standing there. As Josh fired up his old green car to head out to the insurance office, I left to go to work knowing there was still work to do with the tree and the car. I, along with my husband, was worried for Josh too. At lunchtime, I stopped by Pages -- I love the deli -- and noticed at the cash register I actually had more cash in my wallet than I thought I had. “That’s kind of nice,” I thought, knowing that doesn’t happen very often on our budget. “Thanks,” I whispered to God. I thought about how the past 24 hours had been rough for our family, but there’s always someone who has tougher problems. As I walked out the door, I whispered “thanks” out loud with a smile on my face. While walking to my car a man I didn’t know said something to me that I didn’t hear very well, so I walked to his car. Turns out he was about to run out of gas and after driving into town to the grocery store and was off to the pharmacy to pick up medicine for a family member he was short on cash. I reached in my wallet and took out the extra $5 and handed it to him. When I was a little girl my Grandma Iva taught me that you give without the expectation of getting anything in return. That was 50 years ago, and the world is a different place now. Sometimes it is hard to give the last of what you have to someone else without expectation of getting it back, even someday in the future. I have to admit my shame that when the man drove away I watched. The cynic in me expecting the worst because that is what society has taught me as I’ve grown up. However, to my delight, the man drove to the pharmacy drive-thru window right across the street. A few minutes later, without trying to find him, I saw him again when I passed the station where he was putting gas in his car. It doesn’t really matter where he went after that because my heart was overjoyed that I truly could help someone else, my neighbor in the world that we both live in. Won’t you be my neighbor too, and pay it forward when you can?